Most of the time when we look at a VPN service we’re talking about desktop clients that run on your PC. There are a few services, however, that build their VPN into a piece of hardware. 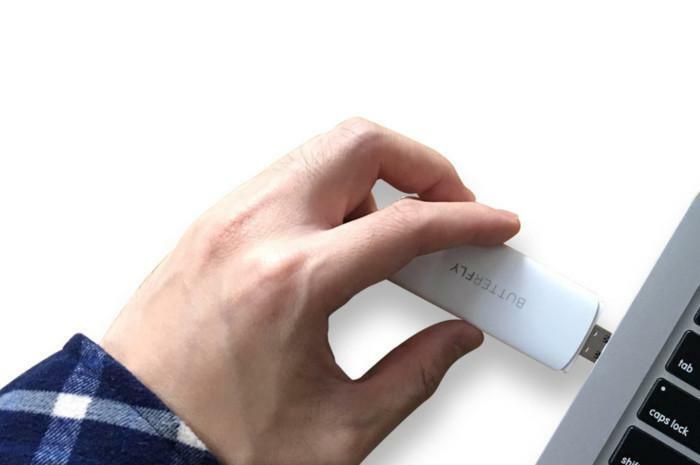 One such service is ButterflyVPN, which sells an $89 USB dongle that can be plugged into any USB port that supplies power. There’s also an option to buy a simple home router (for $99) that automatically connects to the VPN, but this review is covering the Traveler USB Dongle. 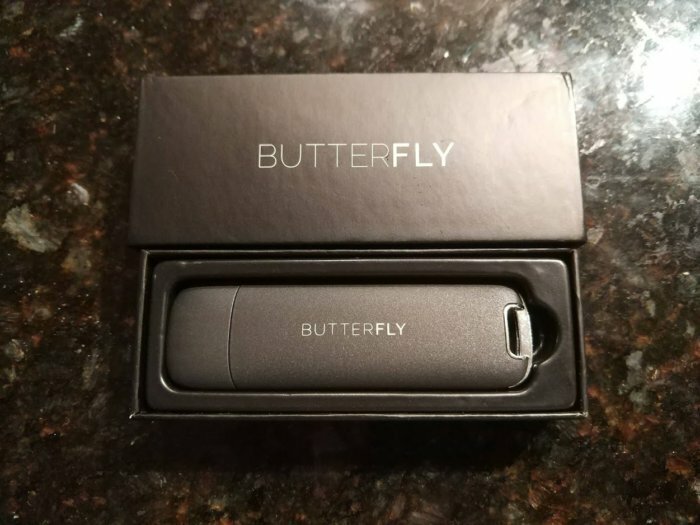 The ButterflyVPN Traveler USB dongle. Initial setup is pretty straightforward. You connect to the Wi-Fi access point, which is named “btfly-XXXX” with the last four characters being a number. 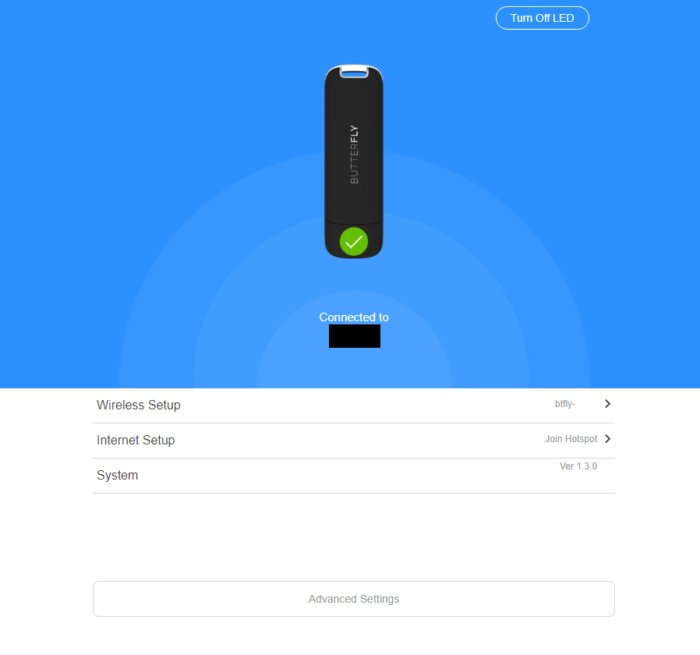 Once you’re connected to the dongle, point it at a Wi-Fi network by going to http://192.168.154.1 or local.btfly.info, which is the dongle’s landing page. Next click Internet Setup, and then select your home Wi-Fi router and enter the password. Once that’s done, you’re ready to hit the wild internet via ButterflyVPN. By default, the password for your dongle is “12345678,” which as we know is a terrible, terrible password. You, of course, will want to change the default password, but it’s a shame ButterflyVPN doesn’t use unique default passwords for its dongles for a bit of extra security. Anyone else on your home network can also use the dongle, with up to 10 simultaneous connections. 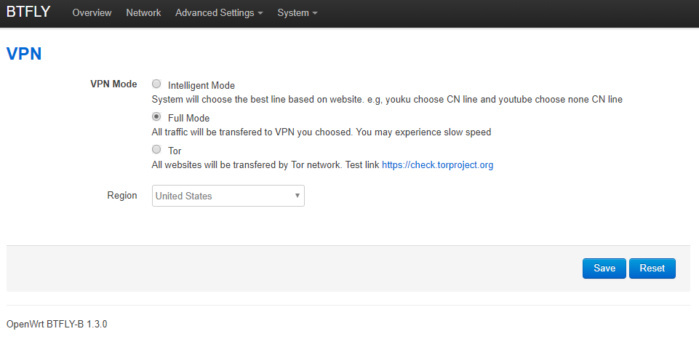 To test if the VPN’s working, just visit DNSLeakTest.com and see if your IP address has changed. In my tests, the VPN didn’t connect when I first joined the Traveler network. I asked if failing to automatically connect was a common problem, and a company representative said it wasn’t. Still, I found the issue to be persistent. To connect, I had to choose a manual connection instead of allowing the dongle to automatically connect for me under Advanced Settings > Advanced Settings > VPN. ButterflyVPN offers six different regions to choose from: Taiwan, Europe, the United States, Singapore, Japan, and China. That’s about the limit of your choices. There are no options to choose specific servers or more exact locations within those regions. That’s unfortunate as you can sometimes end up with, say, a connection out of California when the east coast would be a better option, as happened to me on several occasions. Using the Advanced Settings, the dongle can also connect to the Tor network, which is a nice addition, and under Advanced Settings > Advanced Settings > Ads block you can enable an ad blocker (not enabled by default) that seemed to work pretty well in my tests. ButterflyVPN’s advanced settings login supplies the password for you. Before we go on, I have a small quibble about the advanced settings login page. It reveals the default password right above the login area as pictured here. For users to be secure then, they have to know about the Advanced Settings and then change that password as well. Otherwise, anyone who gets into the system could log in and get access to the advanced settings. The things an attacker could do in the advanced settings are limited so perhaps it’s not the biggest deal in the world. Though anyone on the network could log in and create minor annoyances such as changing the administrative password or resetting the entire device to a factory state. 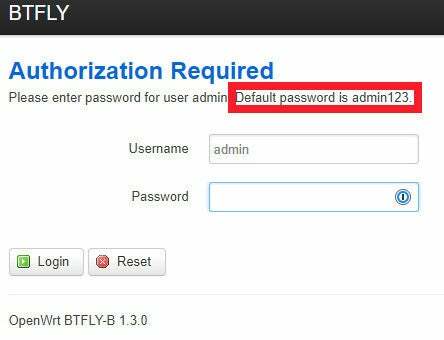 ButterflyVPN’s interface is a customized version of OpenWRT, an open-source firmware for routers. Since ButterflyVPN’s Traveler is a Wi-Fi device we couldn’t run the tests over a hard line. For that reason, there may be more variation in our results than usual since Wi-Fi is less consistent than ethernet. ButterflyVPN’s location choices are also far more limited than usual. We were still able to get U.S. and UK speeds, with the Netherlands, Taiwan, and Japan filling out the rest. For these tests, Traveler was plugged directly into the Wi-Fi router. Overall, ButterflyVPN only maintained around 18 percent of the base speed, which puts it well into the lower rung of VPNs we’ve tested. The U.S., European, and British connections were all in the double digits and all country connections tested provided enough bandwidth for 1080p video streaming and other standard uses. Still, it’s not as fast as other VPNs we’ve tested. Butterfly VPN is distributed by Gomoft Inc, which has a business address of 440 North Wolfe Rd., Sunnyvale, CA 94085—where the Plug and Play Tech Center startup accelerator is located. ButterflyVPN, meanwhile, is officially based in Panama, but its development offices are in Taiwan. ButterflyVPN’s founder is named Zoey Hahn. ButterflyVPN is a convenient hardware device you can take anywhere and use with multiple devices. The speeds are fine, but I’d rather see the company be more transparent about its team and where it truly is in the world as there isn’t much information on its site currently. It would also be better if the company were using a standard VPN protocol instead of something proprietary. For these reasons I can’t wholeheartedly recommend it. But if you like the idea of a small, portable VPN hardware device for non-mission-critical uses then ButterflyVPN might appeal.